Every person has the possibility of being perfected by God, so everyone should understand what sort of service to God would be best in line with His intentions. Most people do not know what it means to believe in God, nor do they understand why they should believe in Him. That is to say, most have no comprehension of God’s work or the purpose of His management plan. These days, a majority of people still think believing in God is about going to heaven and having their souls saved, and have no idea what believing in God means, specifically; moreover, they do not have any understanding whatsoever of the most important work in God’s management plan. For various reasons of their own, people simply do not take any interest in God’s work, and give no thought to His intentions or to His management plan. As an individual in this stream, each person should know what the purpose of God’s entire management plan is, the things that He has already made into reality, why He has chosen this group of people, what is the purpose and meaning in His choosing them, and what He wants to achieve in this group. In the nation of the great red dragon, God has been able to raise such a group of inconspicuous people, and He has continued to work until now, trying and perfecting them in all sorts of ways, speaking countless words, performing much work, and dispatching so many serving objects. Through God’s accomplishment of such enormous work, its significance can be seen to be great indeed. You cannot yet fully perceive this. Therefore, do not view the work that God has done on you as trivial; this is no small matter. Even just what God has shown you today is enough for you to try to fathom and know. Only if you truly and thoroughly understand it can you experience it more deeply and make progress in your life. Nowadays, what people understand and what they are doing are far too little, and cannot fully fulfill God’s intentions. This is the insufficiency of humans and their failure to fulfill their duty; thus, the desired results have not been achieved. The Holy Spirit has no way to work on many people because they have such a shallow understanding of God’s work, and are unwilling to treat the work of the house of God as something valuable. They invariably go through the motions just to get by, or else follow the majority, or just work for show. Today, each person in this stream should recall whether they have done everything they can in their actions and deeds, and whether they have given an all-out effort. People have not fulfilled their duties at all. It is not that the Holy Spirit does not do His work, but that people do not do theirs, making it impossible for the Holy Spirit to do His work. God has finished saying all the words He had to say, but people have not kept up at all, and have fallen too far behind; they have been unable to stay close with every step, and unable to follow closely the Lamb’s footsteps. What they should abide by, they have not abided by; what they should have practiced, they have not put into practice; what they should have prayed for, they have not prayed for; what they should have set aside, they have not set aside. They have not done any of these things. Therefore, this talk of attending the banquet is empty and has no real meaning at all; it is in their imagination. It can be said that so far, people have simply not discharged their duty. Everything has depended on God’s doing and saying things Himself, whereas people’s function has truly been far too small. They are all useless trash who do not know how to coordinate with God. God has spoken hundreds upon thousands of words, yet people have not put any of them into practice—from forsaking the flesh, discarding notions, practicing obedience to God in all things, while at the same time developing discernment and gaining insight, to letting go of their preoccupation with people’s status, eliminating the idols in their hearts, rebelling against their wrong intentions, not acting out of emotion, doing things fairly without bias, thinking more about God’s interests and their influence on others when they speak, doing more things that benefit God’s work, keeping in mind the benefiting of God’s house in all that they do, not letting their emotions determine their behavior, discarding what pleases their own flesh, eliminating selfish old conceptions, and so on. Of all that God has said about what He requires of people, they actually do understand a few things, but they are simply not willing to put them into practice. What else can God do and how else can He move them? How can sons of rebellion in the eyes of God still have the nerve to pick up His words to admire them? How do they have the nerve to eat God’s food? Where is humanity’s conscience? They have not even fulfilled the bare minimum of the duties they should have fulfilled, so it is pointless to talk about doing their utmost. They are living in a pipe dream, are they not? There can be no talk of reality without practice. This is a fact that is as plain as day! You ought to be studying lessons that are more realistic. There is no need for that high-sounding, empty talk that people admire. When it comes to talking about knowledge, each person’s is higher than the one before, but they still have no path to practice. How many people have understood the principles of practice? How many have learned actual lessons? Who can fellowship about reality? Being able to speak of knowledge of God’s words does not mean you possess genuine stature; it only shows that you were born smart and gifted. It still comes to nothing if you cannot point out the path; you would be useless trash! Aren’t you pretending if you cannot say anything about an actual path to practice? Aren’t you faking it if you cannot offer your own actual experiences to others, thereby giving them lessons they can learn from or a path they can follow? Aren’t you a phony? What value do you have? Such a person could only play the part of “inventor of the theory of socialism,” and not “contributor to bringing about socialism.” To be without reality is to have no truth. To be without reality is to be a good-for-nothing. To be without reality is to be a walking corpse. To be without reality is to be a “Marxist-Leninist thinker,” with no reference value. I urge each of you to shut up about theory and talk about something real, something genuine and substantial; study some “modern art,” speak something realistic, contribute something actual, and have some spirit of dedication. Face reality when speaking, and do not indulge in unrealistic and exaggerated talk to make people feel happy or think of you differently. Where is the value in that? What point is there in stirring up people’s enthusiasm for you? Be a bit “artistic” in your speech, be a bit more fair in your conduct, be a bit more reasonable in your work, be a bit more realistic in addressing people; keep in mind bringing benefit to God’s house with your every act, listen to your conscience when your emotions arise, do not repay kindness with hate or be ungrateful to kindness, and do not be a hypocrite, lest you become a bad influence. When you eat and drink God’s words, link them more closely to reality, and when you fellowship, speak more about realistic things. Do not be condescending; this will not satisfy God. 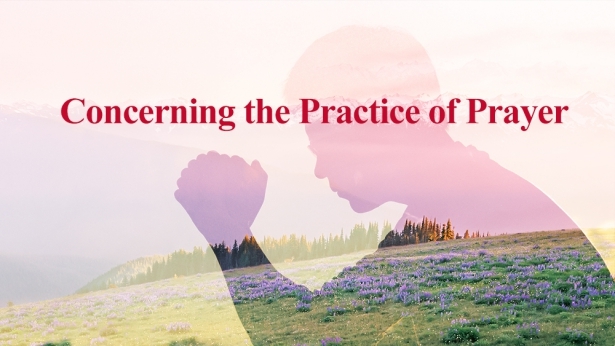 Be a bit more patient and tolerant, a bit more yielding, be a bit more magnanimous, and learn from the “spirit of the prime minister.”[a] When you have bad thoughts, practice forsaking the flesh more. When you are working, speak more of realistic paths and do not get too lofty, or else your words will go over people’s heads. Less enjoyment, more contribution—show your selfless spirit of dedication. Be more considerate of God’s intentions, listen more to your conscience, and bear in mind more—and do not forget–how God speaks patiently and earnestly to you every day. Read the “old almanac” more often. Pray more and fellowship more frequently. Stop being so muddled; show some sense and gain some insight. When your sinful hand reaches out, pull it back and do not let it extend so far. It is useless, and what you get from God will be nothing but curses; be careful. Let your heart take pity on others, and do not always strike out with weapons in hand. Fellowship more about knowledge of the truth and talk more about life, maintaining a spirit of helping others. Do more and say less. Put more into practice and less into research and analysis. Let yourselves be moved more by the Holy Spirit, and give God more opportunities to perfect you. Eliminate more human elements; you still possess too many human ways of doing things, and your superficial manner of doing things and behavior is still repugnant to others: Eliminate more of these. Your psychological state is still too detestable; spend more time amending it. You still give people too much status; give more status to God, and do not be so unreasonable. The “temple” belongs to God in the first place, and should not be occupied by people. In sum, focus more on righteousness and less on emotions, and it would be best to eliminate the flesh; talk more about reality and less about knowledge, and it would be best to be silent; speak more of the path of practice, and have less worthless big talk—and it would be best to begin practicing right now. God’s requirements of people are not all that high. If they even put in a little bit of effort, they would receive a “passing grade.” Actually, understanding, knowing, and comprehending the truth is more complicated than practicing the truth. Knowing and comprehending the truth comes after first practicing the truth; these are the steps and method of the work of the Holy Spirit. How can you not obey it? Will you be able to have the work of the Holy Spirit by doing things your way? Does the Holy Spirit work at your pleasure, or based on your deficiencies according to God’s words? It is pointless if you cannot see this clearly. Why is it that most people have spent much effort reading God’s words, but merely have knowledge and cannot say anything about a real path afterward? Do you think that possessing knowledge amounts to possessing the truth? Is that not a confused point of view? You are able to speak as much knowledge as there is sand on a beach, yet none of it contains any real path. In this, are you not fooling people? Are you not making an empty show with no substance to back it up? All such behavior is harmful to people! The higher the theory and the more it is devoid of reality, the more it is incapable of taking people into reality; the higher the theory, the more it makes you defy and oppose God. Do not treat the loftiest theories like precious treasure; they are pernicious, and serve no purpose! Perhaps some people are able to talk of the loftiest theories—but these contain nothing of reality, for these people have not personally experienced them, and therefore have no path to practice. Such people are incapable of taking humanity onto the right track, and will only lead people astray. Is this not harmful to people? At the very least, you must be able to solve their present troubles and allow them to achieve entry; only this counts as dedication, and only then will you be qualified to work for God. Do not always speak grandiose, fanciful words, and do not use a bunch of unsuitable practices to bind others into obeying you. Doing so will have no effect, and can only increase their confusion. Leading people this way will result in many pieces of regulation, which will cause people to loathe you. This is humanity’s shortcoming, and it truly is mortifying. Thus, talk more about problems that currently exist. Do not treat other people’s experiences as private property by mentioning them for others to appreciate; you must search for your own, individual way out. This is what each person should put into practice. If what you fellowship can give people a path to walk, then that amounts to your possessing reality. No matter what you say, you must bring people into practice and give them all a path they can follow. It is not about only making it so that people have knowledge, but more importantly, it is about having a path to walk. For people to believe in God, they must walk the path led by God in His work. That is, the process of believing in God is the process of walking the path led by the Holy Spirit. Accordingly, you must have a path you can walk no matter what, and you must walk onto the path of being perfected by God. Do not fall too far behind, and do not get involved in too many things. Only if you walk the path led by God without causing interruptions can you receive the work of the Holy Spirit and possess the path of entry. Only this can count as being in line with God’s intentions and fulfilling humanity’s duty. As an individual in this stream, each person should fulfill their duty properly, do more of what people should be doing, and do not act willfully. People carrying out work must make their words clear, people who follow must focus more on enduring hardship and obeying, and all must keep to their place and not step out of line. It should be clear in the heart of every person how they should practice and what function they should fulfill. Take the path led by the Holy Spirit; do not go astray or be erroneous. You must see today’s work clearly. Entering into today’s work method is what you should practice. It is the first thing you must enter. Do not waste any more words on other things. Doing the work of God’s house today is your responsibility, entering today’s work method is your duty, and practicing today’s truth is your burden. a. The spirit of the prime minister: A classic Chinese saying used to describe a person who is broad-minded and generous. Previous：How Is Your Relationship With God?